I attended University in the United States from 2004 – 2008. During that time I started watching TV with my roommates and friends, and one of the shows that we would not only watch, but we’d anticipate and wait for each week was Bizarre Foods with Andrew Zimmern. 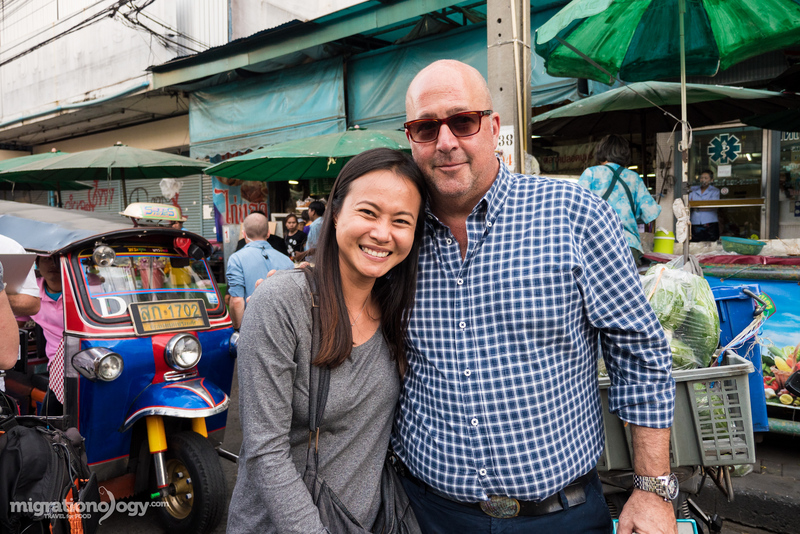 But I would have never guessed that I would have the opportunity to not only meet Andrew Zimmern in person, but to also share a meal with him at one of my favorite restaurants in Bangkok. In this blog post, I’ll share with you what happened, and also share the places and foods we ate. 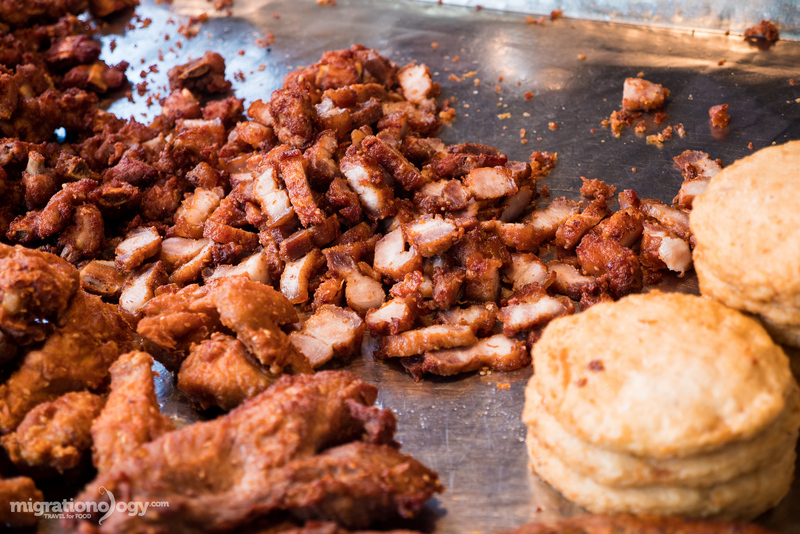 But first, if you have a few minutes, click play below to watch the full video of eating in Bangkok with Andrew Zimmern! 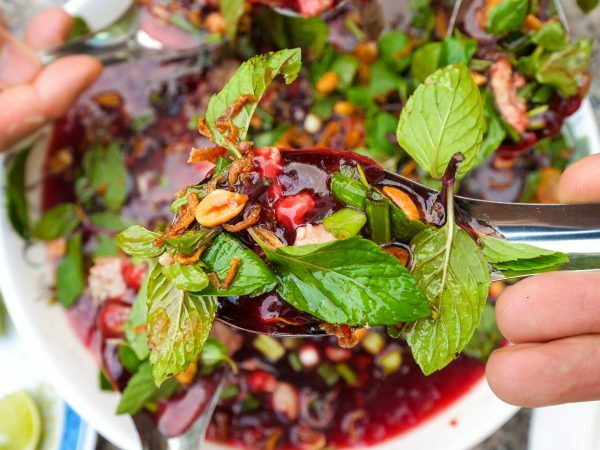 At the end of 2014, Ying (my wife) and I were eating our way around Saigon. One day, when we were hanging out with Kyle Le, who by the way makes fantastic videos about life and culture in Vietnam, was contacted by the Bizarre Foods production team. They were in Saigon, and wanted to film with Kyle. For the first scene of the show (before Andrew even arrived in Vietnam), Patrick the producer, wanted a few of Kyle’s friends to join in eating some street food for some extra video shots, and Kyle invited my wife and I to go hang out and eat. That’s where I originally met Patrick, one of the producers of Bizarre Foods (so big thanks to Kyle). Almost exactly one year later, Patrick contacted me, saying Andrew and the team were coming to Bangkok to film a brand new TV show (the name of the show is still unknown at this time), and wanted to film a couple scenes of me taking Andrew around and eating. And when Patrick mentioned I could vlog while hanging out with Andrew, I was even more excited. The day came, and I headed over to the Dusit area of Bangkok to meet up with the entire production crew. For the first scene, we met up with P’Weera, a local tuk tuk driver, and the plan was for myself and Andrew to cruise around, do some chit-chatting in the back of the tuk tuk, and make our way over to our first meal. 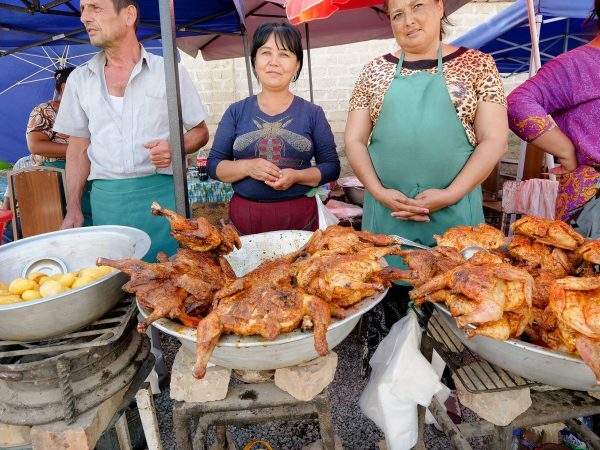 What I immediately loved about Andrew Zimmern and the entire crew was that they (while they did make some decisions about filming and how to go about doing things), they really wanted to be as natural as possible and just roll with what happened naturally and un-staged. I’ve already written about Soei (ร้านเส่ย) many many times and proclaimed my love for the restaurant, the food, and the chef. We arrived at Soei (ร้านเส่ย), and after just a little bit of camera coordination and deciding where to sit, P’Weera, Andrew, and I, sat down and ordered a couple of dishes – 6 to be exact. The life changing fried egg salad! Kaem pla too (แก้มปลาทูทอด), which are deep fried mackerel faces, are one of the signature dishes at Soei, and they are always incredibly delicious – one of the absolute best snacks to begin with when you eat there. Andrew, pulled a pretty awesome move by putting a crispy mackerel head on a Go Pro, and eating it off the camera – that should be a cool shot. We’ve eaten six dishes, five of which have been the best dishes of their types that I’ve ever eaten. And the sixth one is the first time I’ve eaten anything like it, and the quality of the cooking here, and the skill, and precision, a lot of great technique… this is an amazing, amazing place. It was another wonderful meal at Soei (ร้านเส่ย) restaurant. P’Soei (the owner and chef) is truly one of my food heroes. For many years now, Ratchawat Market has been one of my favorite markets in Bangkok. Not only is there so much good food around the area and around the market, but also because it’s tucked away in the quiet and green Dusit area, and although it can get busy at peak meal times, it has a sense of peace and friendliness to it. From Soei, we jumped back in the tuk tuk, and drove to Ratchawat Market (ตลาดราชวัตร). P’Weera, our tuk tuk driver, was in charge of leading us to our next food destination. Right inside the main part of the market is a Thai bakery, and one of their specialities is hot dogs (yes, you read that right). We ordered a couple different versions, one that was basically a pig in the blanket, and one that looked like a hot dog filled hot cross bun. I didn’t get any photos of the hot dogs (because we were filming), but here’s some squid we walked past. I think Andrew and I agreed, the hot dogs weren’t the best things we’d ever tried, but we acknowledged how and why they were so popular – mainly because they were very different from Thai food, and P’Weera mentioned that they reminded him of his childhood – so they were comforting. 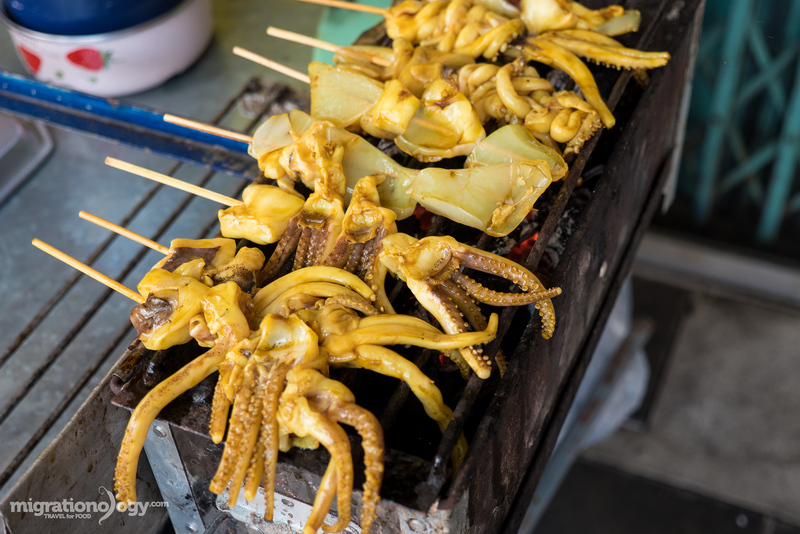 After doing some snacking through the market at a couple of fruits stalls, and enjoying some delicious sweet tamarind and a pomelo, we moved on to the front of the market where we made an impromptu stop at an all things fried and greasy meat stall. We ordered a couple bags of meat, including some sai ooah (northern Thai herb sausage) and a nice big bag of moo krob (fried pork belly). There’s no denying how greasy it was, but wow it was good. Another one of my standard restaurant stops at Ratchawat Market is One Star Bet Yang Ratchawat (ร้านวันสตาร์ เป็ดย่าง ราชวัตร), a glorious and very popular roast duck restaurant. During the actual show we arrived a bit late and they had nearly sold out of all the roast duck (note that the photo above is from a different time I ate there). However, they still had a few portions of roast duck (เป็ดย่าง), and they had a bunch of one of the best parts of the duck: the neck. 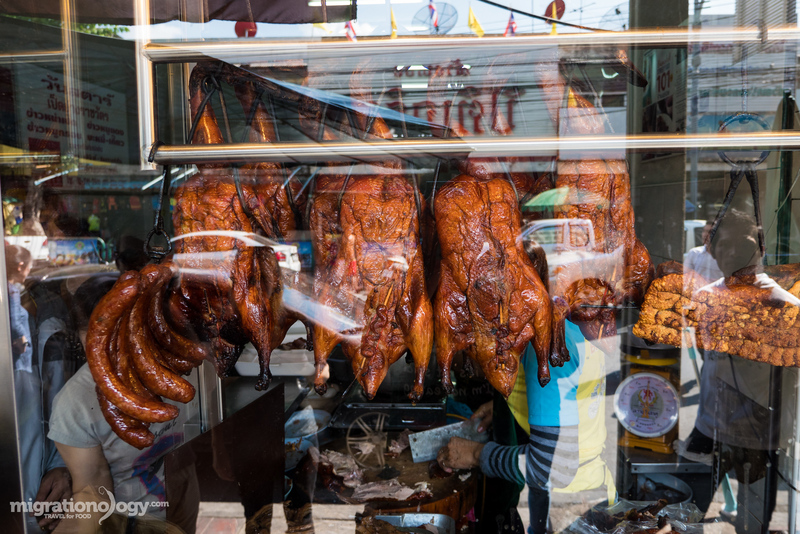 We got a couple bags of roast duck necks, and standing on the sidewalk, Andrew and I devoured all the crispy and delicious skin off the necks. There were fantastic! The afternoon went by extremely fast, and after filming a few extra scenes (including a drone shot from above, of us arriving to the market in the tuk tuk), we completed the shoot, and said goodbye to Andrew, Patrick, and the team. Andrew Zimmern is someone who, since I first remember watching his TV show, I felt a connection with because of his love for food, his willingness to try nearly everything, and his respect for other cultures (through food). 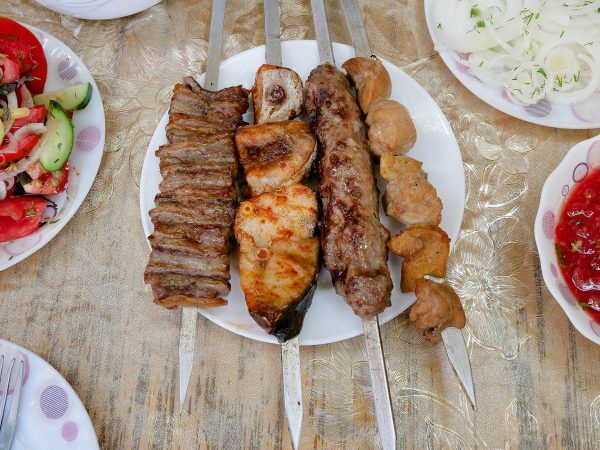 I’ve been a lover of food and travel since way before I can remember, and the reason I started traveling after graduating from University in 2008, was to eat. At that time I decided to start a travel blog (this one here), and eventually I made a commitment to start posting food videos on YouTube, and learning as much as I could along the way. I had no idea what it would lead to and what would happen, and I didn’t even have an interest in being on camera at first. But I decided to try something new. Without ever trying, I never would have known how much I enjoyed filming, making, and sharing food videos. 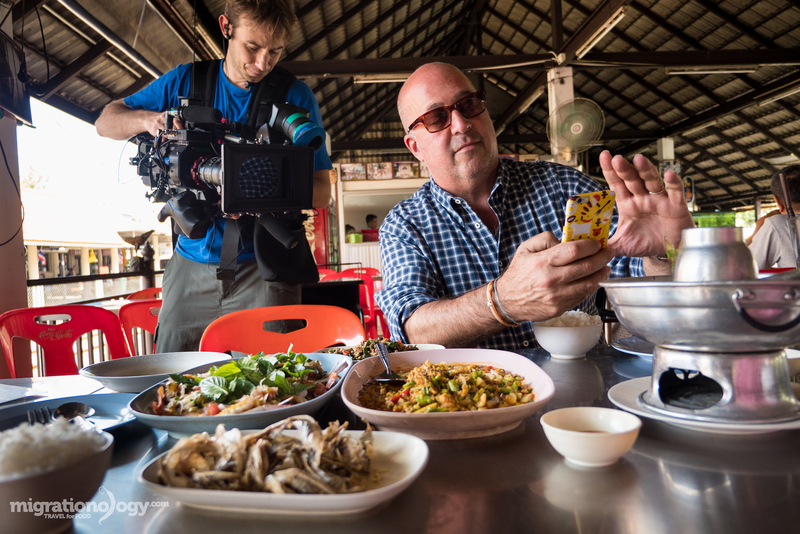 It was a real honor to have the opportunity to hang out with Andrew Zimmern in Bangkok, and I want to say a big thank you to Andrew, Patrick, Erin, and the entire crew. One of the main points of writing this article is because I want to encourage you. If there’s something you’ve always wanted to do, or something you’ve been scared to do, or something you’ve been putting off… do it now! You never know what you’ll learn, discover, find, or the many opportunities that can arise as a result of you doing things and trying new things. 55 comments. I'd love to hear from you! I’ll be in Bangkok July 13-17th for the first time! I am ready to see what its about, it’s my first time in Thailand and I look forward to making videos for my YouTube channel. Congratulations to you (Mark) and your family (Ying & Micah). Your new baby is SUPER CUTE !! We have been following, watching your videos for over a year now. In this past year, we went to Bangkok twice. Loved it both times. We followed many of your advice on the 15 episodes you have done about Bangkok. We watched it over and over again. We watched them so much, we even watched them while we were in Bangkok to remind us on what we need to do and visits. We will continue to support your programs and video. Maybe we may even run into you in Bangkok some day. Again, congratulations with your new baby. Ty I clicked on the link ty so much for providing the names of the dishes in both languages woohoo! Now I can be a poser at my neighborhood Thai restaurant The Lucky Duck ???? You Rock! Oh btw it was awesome to her the wifey speak English …. ???? Awesome to hear that June, enjoy! You are so lucky that had the chance top work with The Andrew Zimmern. I love your food trip with him and the food are all mouth watering, I want to visit Bangkok soon!!! Hey Mark, Do you know when this episode of you and Andrew Zimmern will be released? I’ve been searching around, but couldnt find it. Love the video, the first time I tried Thai food was in Bangkok and i immediately fell in love with it. Mark, my wife and I really enjoyed your vlog you did with Andrew at Soei along with all your other vlogs. My wife and I are coming to Bangkok at the end of June and will for sure be eating a Soei among other places you have recommended. If you and wife are available sometime during the last week of June or first week of July I would love to take you guys out for meal just drop me an email so I can contact you. Hi Terry and Suzanne, thank you very much, and awesome to hear that you’ll be coming to Bangkok soon. I’m going to be traveling during that time, but hope you have a great trip and enjoy Soei! Stumbled across this just in time! I’ll be traveling in Bangkok mid-July with my son who just graduated from high school. I’m gonna score some big mommie points by taking him to Soei. My boyfriend is such a humongous fan of yours and loves your videos so so much. You are one of his inspirations and I have been trying to contact you to arrange a surprise meet up. I have no idea if you do this but I would really love it if you could let me know! It is his birthday soon and it would literally rock his world, just like this guy did for you. Please do get in touch if you can!!! It would be incredible! P.S. I have contacted you on Insta and through the contact page under a different name. The email I have provided in this entry is correct although the email address in my original messages is different. Mark, I know that Laos doesn’t have much varieties in the area of food, but I hope you can go to Laos and do a few food vlog from there. This is just amazing! Me and my husband ensure we eat at-least 1 item we’ve never had before, whenever we step in a new country. And I’m glad we do! We’ve had crocodiles and wood worms in Philippines, wild boar in Goa..etc. Andrew is my all-time favorite foodie too! I always love watching your videos Mark! I’m a fan. I am going to Thailand soon. 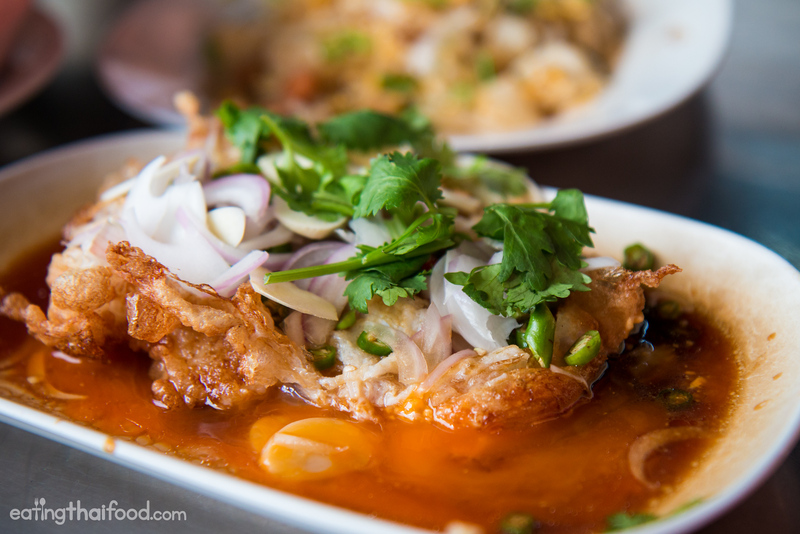 I can’t wait to taste authentic Thai cuisines featured in your blogs! More power and God bless! Thank you very much Cecile, really appreciate it! Hey Mark . Just recently found you on YouTube . I have enjoyed watching your videos . Did not released you had some many . Really enjoyed the one with Andrew Zimmerman. There was a video where you was doing a tv documentary . Are does tv shows on YouTube ? Look forward to seeing many more videos and blogs . Wish you much success . Hi Pete, good to hear from you, thank you very much for your support. That was a TV show with Andrew Zimmern which will be airing sometime in 2016. Thank you! Thank you for all the great tips! My husband and I really enjoy your youtube videos. And we used them as foodie research. We live in Hawaii, but are visiting Thailand now, celebrating our 28th wedding anniversary! We had the BEST meal ever at soei, twice this week. Traveling really is all about the food isn’t it?! Hi Chrissy, great to hear from you, thank you very much, glad you enjoyed Soei so much. And congratulations! this is a great video !! cant wait to go . i am there next week in BKK . thanks for the tips .. I love love you and Andrew ❤ Do not ever stop making awesome food videos. Absolutely amazing! I’m traveling to thailand with my girlfriend in a few weeks, do you think I’m gonna have any problems ordering food in english in places like SOEI or other thai restaurants? It looks amazing! Amazing post talking about your experience on meeting Andrew Zimmern! The video showing the meal time shared by you with the foodie guy you admired is really intriguing. Thanks for sharing your experience with us! Really, really gotta try to go to Soei next time… The food looks incredible. Very cool! 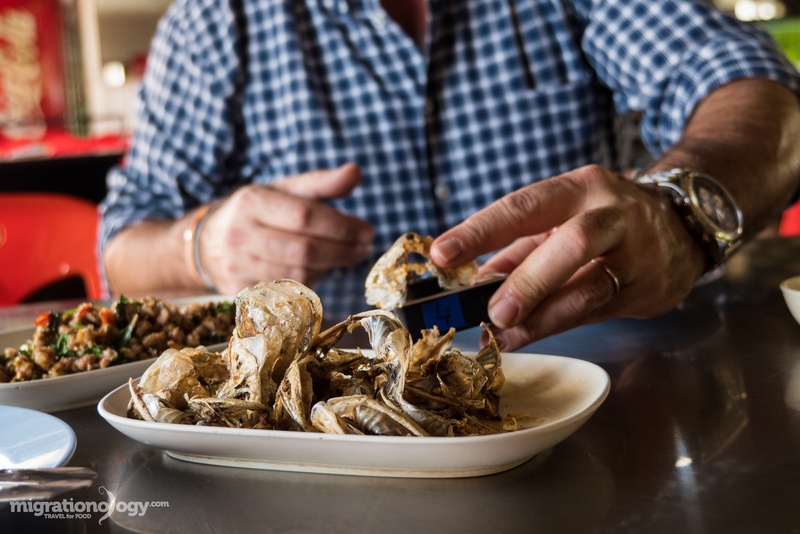 We’ve watched a lot of Zimmern’s shows and love exploring the world through food. But I can’t even imagine how cool it must have been to log your own experiences hanging out with him. Congrats! Nice film Mark, it’s inspiring me to taste all dishes of menu in P’Soei Restaurant. This is very nice watching both of you onTV together. Amazing and awesome you got to hang out with him. Thai foods are always make me hungry. I wish you many more tv shows & looking forward watching u on new tv programs. I love the video of you and Andrew, watched it several times with my husband. One of our favorite episode! I’ve been watching Andrew’s shows and your videos for quite some time now. It’s so awesome to see you two on screen together. First, congratulations on meeting up and being a part of his new show. His show has also been one of my favorites in terms of different foods and culture. He does have a way of using his facial expressions and his eyebrows to make a point about the food he has eaten. We were in Bangkok this past summer and noticed that you stayed in the Chatrium Hotel which we really loved and enjoyed. It’s too bad we did not know our ways around Bangkok as you do else I would have eaten across the street of the Chatrium Hotel. I love food and I love learning about culture. I wish I had more money to travel and try all the different food around the world. I like your videos of Bangkok which I have been following because they are so informative, entertaining, and fun. Questions – What kind of camera, microphone, computer and video software do you use to make your blogs? I love using the Mac and I use a Canon HD video camera and a Canon EOS 3i. I am planning to buy a camera (SLR) which can also make videos and be attached to an external microphone. Yours have nice HD quality, and I have been impressed by how you videotape holding the camera yourself and getting good quality sound as you walk and talk. Despite the background noise I can hear you loud enough. Your technique of cutting away from one scene to another as you eat the food and start chewing the food is quite good. So did you practice this or did someone teach the technique to you? 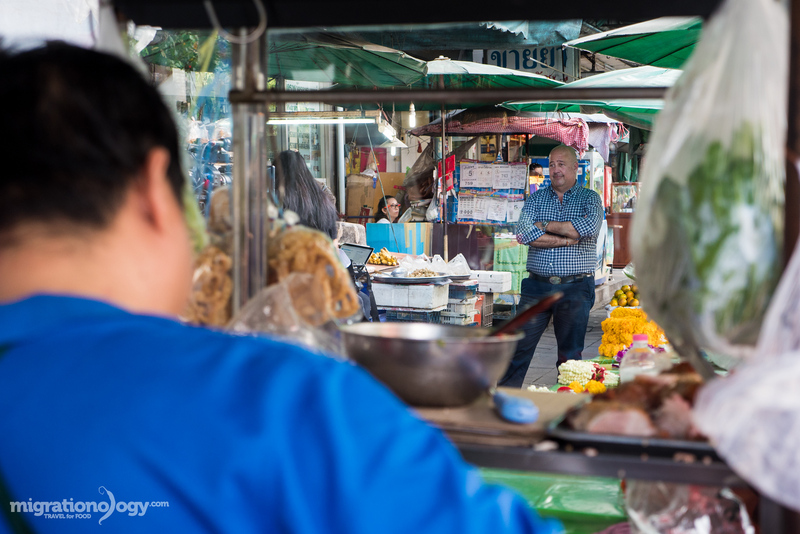 Last question – Is there I way I can meet up with you when we go back to Bangkok to really try some of the street food and great restaurant you have been to on your Bangkok series? I appreciate your time making these videos and making all the food comments about each food you eat. This makes for interesting videos gastronomically and culturally. Hoping to hear from you about the questions I have asked. What a lucky guy you are! You had these great moments with THE Andrew Zimmern. 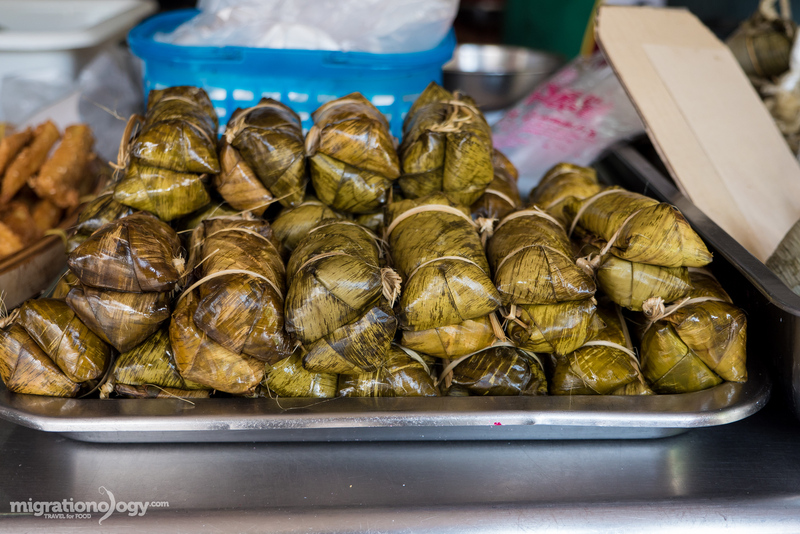 I love Thai food and I like traversing the streets of Bangkok. I hope to get back there soon. Wow did that really just happen? Two amazing things I love to watch happening together is mind blowing! And thank you for the message at the end. I really admire your passion. Surely I’ll follow my dream one day, and having a meal with you and your wife will part of it! This is just so cool, Mark! I’m so happy for you to meet someone who inspired you to do what you are obviously awesome at! Really enjoyed your Vlog and seeing the behind-the-scenes of how these TV shows are made. My wife and I have so much enjoyed Migrationology, and especially your videos. We enjoy your work because of your gleeful genuine love and curiousity of thai food and the way you present and explain everything. You seem like a very kind , honest and compassionate person and to us it shines through and that’s what we love about you, and Ying too. This video you did with Andrew Zimmern was a bit of a shock and dissappointment for me to see because I consider what you do to be quite original and authentic. For me, when I watched this video it disturbed me. I hope you can stay true to your own vision and style. You do not need to share your vlogs with any of those big budget so called “celebrity” tv food presenters. It should be their honour to share the small screen with you! Please do not get sucked into that formulaic world and let anyone take a free ride on your original style. Your vlogs are honestly one of the only true treasures I have found in the saturated world of reality tv and food shows. Please keep being yourslf and get a trustworthy agent if you go on to do any network tv work. One day I hope to meet you and your wife. I know Thailand quite well and travel there every year or two to the north in particular. My wife Chiraphorn (Oi) is from Chiangmai. I am from Toronto and that’s where we currently live. 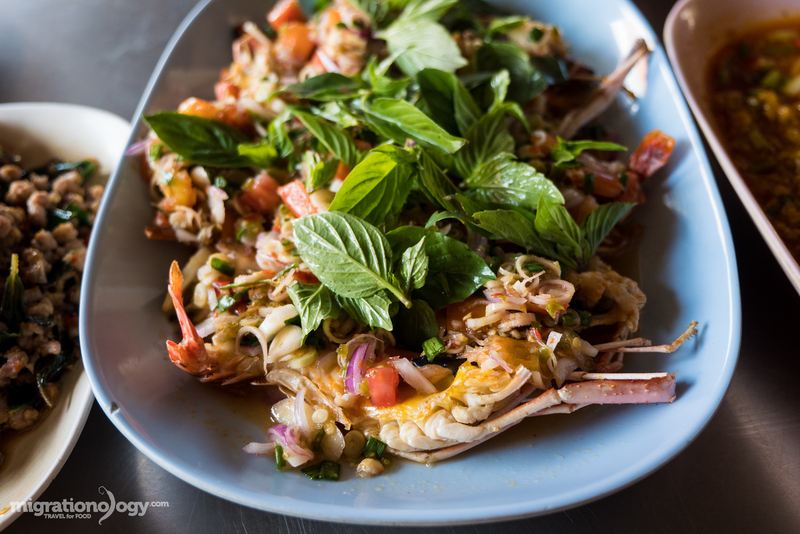 We too love thai food as much as you and we look forward to everything you produce. Keep doing what you do. You make us smile til it hurts and we really have a good laugh watching you taste food. Hi James, thank you very much for your kind and honest words. I will stay true to my style and vision, and I never want that to change, and I appreciate the reminder. Thank you very much for your support, and it would be great to meet you and your wife in the future as well. How often do you come back to Thailand? Greetings to your wife. Thank you! Hey. I just realized that I perhaps made for an awkward situation for you posting my comment and being so direct. Sorry about that, just being honest. I was in Bangkok about a year ago for work (I work as a concert tour carpenter for Michael Bublé). At the moment my wife and I don’t have firm plans for this year but I feel we may go back after this rainy season. Yeah, when we do go back and if you are in Thailand at the same time and not travelling, let’s eat!! It would be a blast. Hello to Ying as well and thank you for the nice reply. Hi Mark, another very inspiring post. Exactly the choice (*) of dishes I would love to try at Soei. Again, many thanks for these awesome and mouth-watering food blogs!. Please keep them coming! 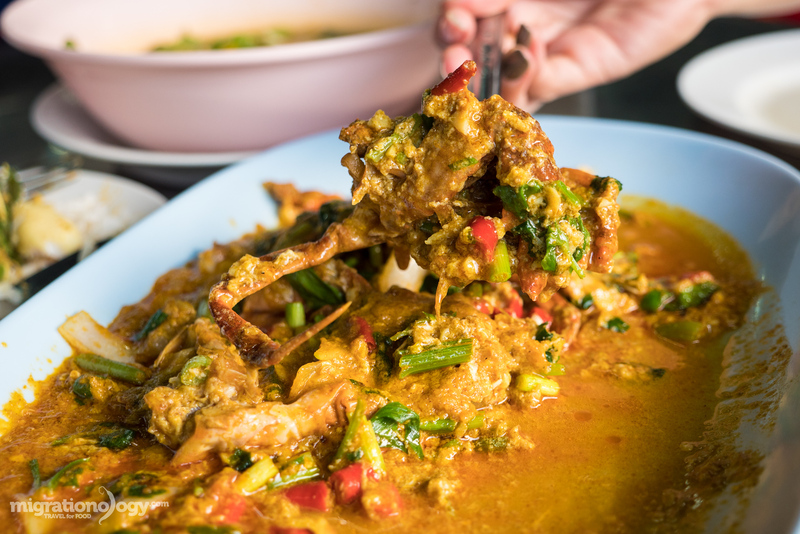 Do you prefer the Soft Shell version over the Hard Shell version of the Yellow Thai Egg Curry dish? Hey Ralf, thank you very much. I’ve never had the hard shell version at Soei so far… but I think it would be good too. I like the soft shell though, because it’s something I very rarely eat, and I love how you don’t need to peel it. Very encouraging. Glad you shared your adventure w/ Andrew in Bangkok, along with mentioning Soei Restaurant & Ratchawat Market. With the vast amount of food related posts you’ve provided, I must of missed those two. I’ll definitely be checking them out. Thanks! Thank you Lindo. Hope you enjoyed exploring Wang Lang Market! Hey Daniel, thank you very much, tell them all I said hello! Great post, Mark! Absolutely awesome and amazing you got to hang out and share a meal with one foodie guy you admired! I especially liked your final message on this post about encouragement to go out there and try something new or something we’ve been scared to do. I wish you many more food adventures and look forward to watching you on this new show with Andrew! Hey Jenn, thank you very much! WOW this is FANTASTIC! I love Andrew’s shows and I love your videos: you two appearing together on TV will be, I am sure, an awesome and well deserved boost for your visibility on youtube! I look forward to watching the show your featured in, and I hope the best for you and Ying. Thanks for all your hard work! Thank you very much Audrey, really appreciate it!